When we pulled up to Hotel 1000 the valet station was crazy! Many of our guests were all arriving at the same time and since the hotel is located right in the middle of downtown Seattle they don't have the capacity to handle more than 3 or 4 cars pulling up at once. 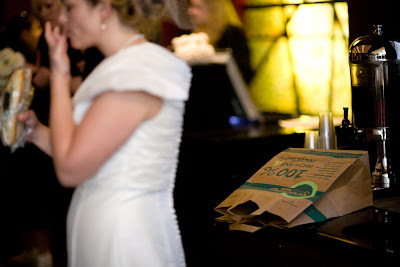 The valet started to wave us forward, as if to say "circle around the block and try again in a few minutes", but this bride knew what she was paying for so I hopped out right in the middle of traffic. As soon as they recognized me (for the past three days they had all been calling me by name, but the big ivory dress helped as well) they ran over and helped us both out of the car. Don't mess with the bride, boys. 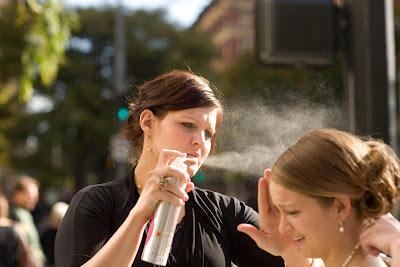 My bridesmaids came over with my emergency bridal backpack and started to spray me down. 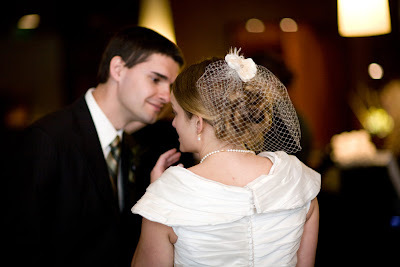 My hair was getting rather snarly by this point because every time I gave someone a hug they put their arm around my neck and tugged on my veil. 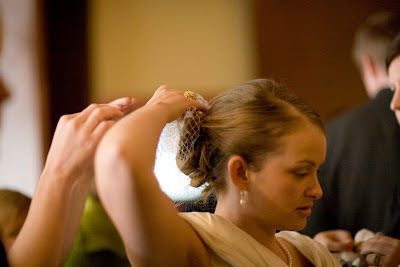 I usually try to avoid hairspray at all costs, but I got a really good dose of it on the wedding day. With my hair sufficiently plastered down it was time for the birdcage aka "party veil". I bought the veil from Something Bold, and the flower from Easter Yu. The veil was a really funk, crazy shape when it arrived so my mom came up with the idea of pinning it to a roll of paper towels (a full roll) and steaming it into shape. It worked like a charm! Earlier that morning I had asked BM Princess Jess to find a way to sneak a snack into my day. I ate the biggest breakfast I could at about 5 am that morning, but appetizers weren't set to start until 5 pm and there was no time to sit down and eat in between. 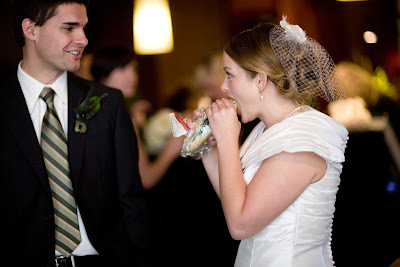 I meant to grab the food from her at the temple so I could eat it on the 15 minute drive between the temple and the hotel, but we both forget and I ended up standing in the hotel lobby stuffing my face while waiting for all the wedding party to gather. 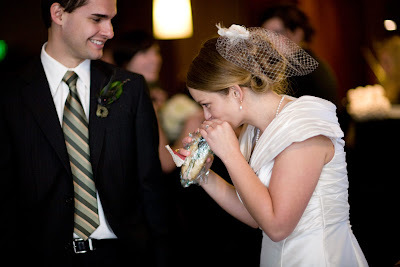 "Yes That Groom, I'm listening to every word you are saying, not thinking about how delicious this sandwich is and how I'm practically making out with it right in front of you." 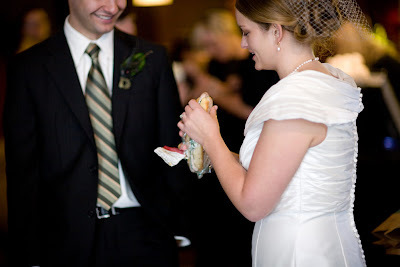 Ivory dress+distracted bride+messy sandwich = potential disaster! Luckily my lovely Evelyn wasn't dirtied in the process. Thanks to BM Princess Jess for stopping in at Whole Foods and saving the day! 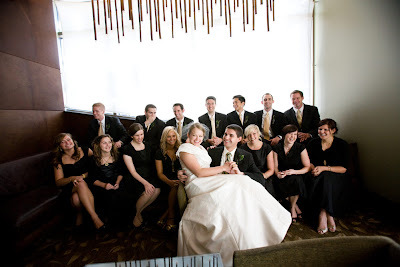 We gathered in the cocktail lounge area of the hotel for a few shots of the entire wedding party together. 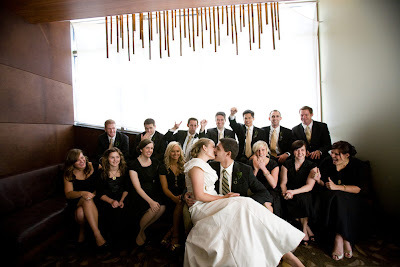 I love this shot with all the guys relaxing and ready to go in back, every single bridesmaid chatting with another girl or checking to make sure they look good, and the two of us oblivious to everything. Kelli told us to kiss, so we did (gladly). Except I got a little bit carried away. Oops! 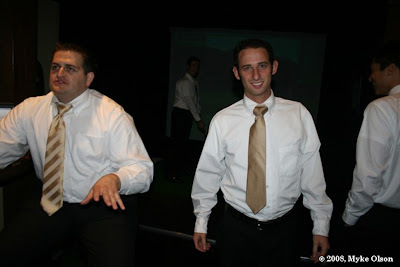 That Groom finally broke things off for the sake of propriety. Yep, I think I'm pretty funny. 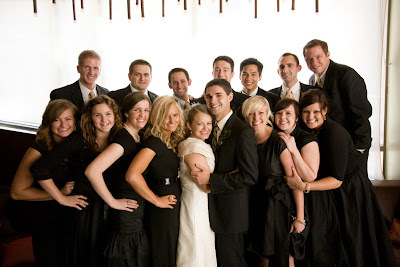 Our wedding party traveled from New York, California, Texas, Utah, Las Vegas and Idaho to be with us. We lurve our friends! After only a few minutes of shooting it was time to send the guys downstairs for some virtual golf and "Caddy Shack" appetizers. That Husband and I agree that the virtual golf was a good idea, but the appetizers were unnecessary. From what I hear, most of the food wasn't eaten and once golf was over they had less than an hour until appetizers were served upstairs. I gathered up all my girls (and my favorite guy) and we headed outside to find the perfect spot for bridal party shots. Once upon a time I lived with a girl named Kelli Nicole. Then she took my wedding pictures. The beginning. Loving the shots with you and the sandwich! Oh my gosh, I love the group shot - Kelly managed to take a lot of people and squish them into an intimate picture. 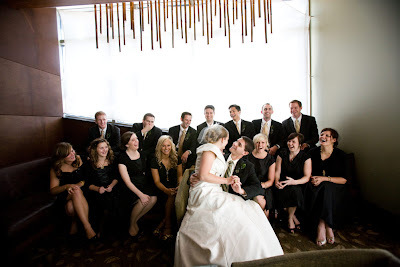 So many times, large bridal parties just look so ... impersonal, just because of the size. The huggy-squishiness is a fantastic way to be close to everyone!